gases produced by ruminating dairy cattle have brought trouble for dairy owners in San Joaquin Valley, California, the us. Around 400-500 of the 1,500 valley dairies will now have to obtain air-operating permits, mandatory for all agricultural operations emitting over 25,000 pounds of volatile organic compounds (vocs) annually. Dairies have been identified as the single largest source of smog producing pollutant in the valley, above light and medium-duty trucks and passenger cars. The Valley Air Pollution Control District recently released a report announcing an updated estimate of voc emission from dairies. After reviewing 15 studies, it estimated the dairy emission factor (ef) of 19.3 pounds per head of dairy cattle per year. The previous ef of 12.8 pounds was based on a 1930s study. The district agreed to review it after the dairy industry filed a lawsuit disputing it in 2004. Regulators proposed an ef of 20.6 pounds in its draft report in June 2005 but later changed it to 19.3 pounds. 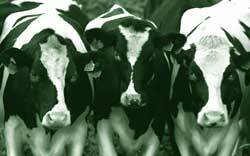 "The new ef dictates that dairies with about 1,290 dairy cattle may need to apply for permits. The old ef meant dairies with about 1,945 dairy cattle needed permits," says district official Kelly Hogan Malay. The new regulations will be announced in June 2006. The ef estimate has remained controversial since its draft stage. While regulators say it is based on best available research, the industry claims it is too high and scientifically unsound. Environmentalists say it is an underestimate and should be around 35-40 pounds. The ef's most controversial aspect is volatile fatty acids (vfas). The estimate shows vfa s contribute 80.31 per cent of the voc emissions. But little California data was available to estimate vfas. So enteric vfa s were determined from data reported by Frank Mitloehner of the University of California and studies from Texas and the uk. Environmentalists also contend that the ef doesn't reflect the entire dairy pollution: it doesn't account for voc s released by manure used as fertiliser, feed storage and other dairy processes. But Malay counters the allegation, saying: "The report mentions there is a need for more scientific study, especially for land applications, phenols from dairy processes, feed storage..."